Dr. Kathy Spreen of Pocopson has written a comprehensive guide to tick-borne diseases. In 2007, as her 20-year-old son battled a fever of 106 and lapsed in and out of consciousness, Kathy Spreen felt utterly lost. Her son had recently found a tick on himself, and the hospital staff either dismissed his symptoms or simply didn't know what to do. The multi-layered maze of tick-borne illnesses -- where every avenue is either a blind end or leads to more questions -- eventually led Spreen to write "Compendium of Tick-Borne Disease: A Thousand Pearls," which is getting universal praise for the way it cuts through the controversy and gives hope to suffering families. The "Pearls" are nuggets of advice and facts that Spreen places throughout the text. Spreen, a physician who lives in Pocopson Township, spent four years researching tick-borne diseases, including Lyme disease, before publishing the 832-page reference book. "I wrote the book that I wish I'd had when my son got sick," Spreen said during an interview last week from her home. "None of the local physicians, including me, had any idea what was going on with him. I was telling my husband, 'It looks like he has malaria.' We thought he wasn't going to survive." The book contains chapters that introduce key concepts, discuss how ticks transmit disease, and offer advice and guidelines for families. It also has in-depth medical information geared to health care professionals -- or readers with a thorough foundation in tick-borne diseases. It's designed as a reference volume for experts and non-experts. Ticks have been around for some 65 million years, essentially unchanged. What makes them dangerous is that they carry blood-borne pathogens from small animals to humans. They usually bite only about three times during their lives. The first blood meal is from a small mammal, such as the white-footed mouse in our region. Then they transfer to larger animals, such as deer, dogs, raccoons, squirrels or foxes. The next step is human beings. But there are some 900 species of ticks, with several common in our area, and the dangerous cocktail of diseases they carry can bewilder even the most diligent physician. The problem is that symptoms of Lyme disease so often mimic other maladies, such as the flu. "In the old days, the great imitator was syphilis," Spreen said. "It was hard to deal with because it presented in so many different ways. But syphilis is a spirochete, and the pathogen that causes Lyme is a spirochete, so Lyme is now the big mimicker. Many people think they just have the flu. They get fatigued, they feel crummy. The majority of people -- 50 to 60 percent -- get well on short-course antibiotics and they're never troubled again. But there's a significant sub-population of 30 to 40 percent with ongoing symptoms that need to be addressed. Those are the people that the book is concerned with. I tried to lay out some options that providers and patients can use to make reasonable decisions, together." that will help those without medical degrees find a pathway through diagnosis and treatment. And it cuts through the web of conflicting -- and faulty -- advice that is spread by many so-called experts. "There's still a lot of the lunatic fringe out there, on both sides of the issue," Spreen said with a sigh. "The people who are writing this stuff -- I have found articles on tick-borne diseases where the name is misspelled in the title. I've read thousands and thousands of blogs and comments, and eventually I had to say, 'Enough of this stuff.' Some of it is ridiculous." The confusion and furor over Lyme disease and associated diseases is partly understandable because people are searching for answers to a bewildering malady. "Some people have become such zealots because they've been sick for so long and nobody is paying attention," Spreen said. "There are so many reasons why health care providers seem to be reluctant to take of these patients, especially if there are ongoing problems. These diseases are just so hard and frustrating." Some of the confusion is attributed to insurance companies which resist paying claims for Lyme, and real estate companies, which are reluctant to reveal that a home sits in a hotbed for Lyme-carrying ticks. Spreen also disputes the Centers for Disease Control figure of 300,000 new cases of Lyme per year in the United States. "That number is probably an underestimate," she said. "The reason is the way they determined the number. They looked at insurance claims. Now, do you think the insurance data might be slightly biased? That only includes the cases that the insurance companies agreed to pay. They also looked at labs that do a lot of testing for Lyme disease. They only checked six labs, and none were labs that many in the Lyme community usually send their samples to. One is inclined to think the 300,000 number is an under-representation." A negative lab test for Lyme, Spreen said, is also no guarantee that Lyme is not present. According to the CDC, Pennsylvania has the highest number of new cases in the nation, and Chester County has the highest number in the state. That means the Chester County area is right in the crosshairs of the tick-borne disease epidemic. There are ways to reduce your risk -- wearing light-colored clothing, long sleeves and pants, spraying yourself with a tick repellent -- but realistically, those measures are not things most people do in the summer, when ticks are most active. While spring and summer used to be tick season, Spreen said that the area's warmer winters over the past several years have allowed tick populations to put prople at risk for more of the year. Without a sustained period of freezing temperatures, the ticks remain active. "I've taken a tick off our dog in January," Spreen said. While humans are not an efficient carrier of tick-borne diseases -- we typically remove ticks and seek treatment as soon as we notice them -- animals such as dogs can harbor ticks for days. "Dogs are called a sentinel species for Lyme," Spreen said. "In a particular area, if you start seeing a lot of dogs with arthritis, kidney problems and death from Lyme disease, it's usually not too much longer before the incidence goes up in the human population as well. Kind of like a canary in the coal mine. Also pertinent to our area are horses. A lot of people with horses own an animal that's been affected by Lyme." Spreen emphasizes in her book that traditional thinking about tick bites is wrong. "It's not just the deer tick," she said. "Other types of ticks spread disease as well. And the tick does not have to be attached for 24 to 72 hours. We have many case reports where Lyme has spread in an hour or two. 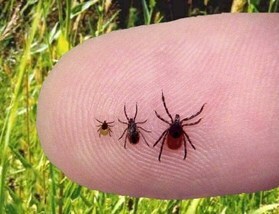 Of all the hundreds of people I know with confirmed Lyme, not one of them has had a tick on them for 24 hours. If a tick bites thinner skin -- on a toddler, for instance -- transmission can be much more rapid. Other tick-borne diseases, some really scary stuff, have been known to transmit in 15 minutes." The bull's-eye rash is another myth, Spreen said. "People think they have to have this target lesion -- the bull's eye -- or you don't have Lyme. The majority of patients never have a rash. When they do, it's usually more like a solid maroon oval, not the thing that looks like a target. Maybe 30 or 40 percent have any kind of rash, and of those, maybe 10 percent have the bull's-eye. If you wait for a bull's-eye rash, you're going to miss half your cases." Spreen said she hopes her book makes a difference in the medical community, and in families that are lost in the health care system. "The local Lyme Disease Association of Southeastern Pennsylvania has a hotline. They get hundreds of calls," she said. "Half of those calls are from health care providers, asking, 'What do we do?' The other half are from patients, saying, 'Can you find me a health care provider who knows what to do?' That's who I tried to target." 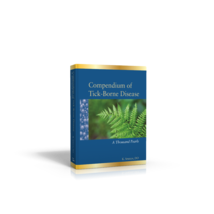 For more information, and a link to Amazon.com to purchase "Compendium of Tick-Borne Disease," visit www.tickpearls.com.